Do you want to make some homemade pizza but you don’t have the “required” pizza stone? Just make a Cast Iron Skillet Pizza instead. There are a few alternatives to help you get your pizza fix without having the requisite pizza stone and we’ll discuss how to use a cast iron skillet or griddle. Let’s talk about why a cast iron skillet or griddle would work nicely for this kind of application. First, most people (and especially people that have stumbled upon this website!) probably have a cast iron skillet. There are many benefits of using cast iron in general and one of the advantages in this scenario is the non stick surface of a well seasoned piece of cast iron. Just cooking pizza in your cast iron cookware will help form and improve the seasoning. In the bowl of an stand mixer, combine yeast, sugar, all-purpose flour, whole wheat flour, corn flour, and salt then combine well, using the paddle attachment. Add butter and water then knead using a dough hook, until the dough pulls away from the sides of the bowl and sort of climbs up the hook a bit. Add a 1 tablespoon water if dough is dry and not coming together. If dough is too wet, add a 1 tablespoon of all-purpose flour. Coat the bowl with olive oil and return the dough to the bowl. Cover with plastic wrap and let the dough rise until it doubles in bulk, about an hour and the amount of time depends on the ambient temperature. It rises faster if it is warmer but let’s aim for room temperature, roughly, about 65-82F. Looking for an easy way to cook brats? Here’s my method. 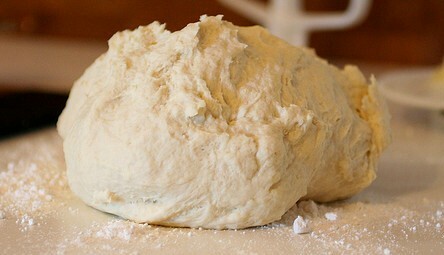 Turn the dough out onto a floured surface and divide in half. Shape the dough into two balls, cover with plastic wrap again and let rest for 15 to 20 minutes. If you only want one pizza for now, put one batch of the dough in a tuperware-type bowl, cover with plastic wrap so the dough won’t dry out, lightly set the lid on top, and place in the refrigerator. Oil one or two 10-inch or 12-inch cast iron skillets depending on how many pizzas you are making. We will just assume one pizza for now. 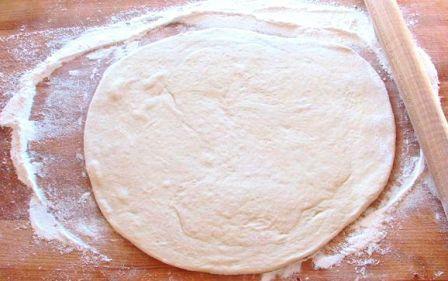 Shape the dough into a circle and transfer it to the skillet. Press dough down in the bottom of skillet and up the sides. Top your pizza with the toppings of your choice (see below for some ideas). Drizzle the pizza with a tablespoon of olive oil and a bit of freshly ground black pepper. Place the cast iron skillet on the stovetop then turn the heat to medium-high for 3 minutes. Now that you’re making your own pizza, make your own tortillas too! Here are my top tortilla press recommendations. As we know cast iron is an excellent heat conductor, and these pans will get hot fast. The bottom of the crust is getting a head start on baking before it even gets to the oven. Bake on lowest rack of your oven. Bake until pizza crust is golden brown and toppings are starting to brown, 10 to 15 minutes. Remove pizza from oven and let it rest for about 3-5 minutes before cutting and devouring! Need mushrooms on tap? Learn how to dehydrate those babies so you always have some when you need them. Speaking of cheese… Check out my post on the best cheese knife in the world! A couple notes on the dough – a longer rise provides more yeasty delicious flavor. So if you can afford to wait or if you do plan ahead, make the dough the day before and place the dough balls in the refrigerator. Take the measures mentioned above to make sure the dough does not dry out and allow plenty of space for the dough to expand. Just take one of the dough balls out 30 minutes ahead of time, about the time that you would turn on the oven to preheat and you should be in good shape. Ready for more ideas on what to cook with cast iron? Check out my guide here. What about a pizza stone pan? Here is my step-by-step guide to the best pizza with a pizza stone pan. And here’s a guide for using a pizza stone. Are you a home chef with ceramic glass cooktops? Or are you looking for the perfect gift? Here are my recommendations for the best cookware for ceramic glass cooktops.